Chinatown in Manhattan is an embarrassment of riches when it comes to cheap and good food. 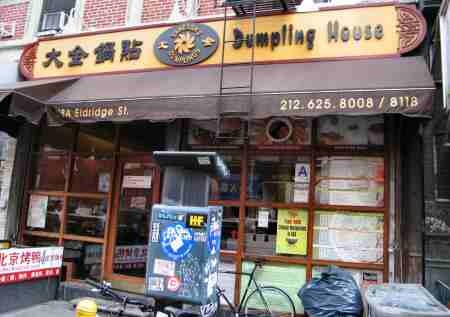 And among the many delights in Chinatown, Vanessa’s Dumpling House on Eldridge St, NYC stands tall. You cannot ask for a better choice than Vanessa’s for a cheap and hearty meal. For the serving size is decent and damage to your wallet minimal. Most items on Vanessa’s Menu are under $5 and several are $2 or less. You order at the counter, pay up, take a seat and wait for your number to be called. Seating is limited and the rest room could be cleaner. Food was fresh and tasty. The two Sesame Pancakes I had were heaven. The first was plain ($1) and the second came with vegetables ($1.75). I particularly liked the Ginger Honey beverage as the hot drink was comforting on a chilly day.